Advocate is seeking 25 dedicated and enthusiastic individuals to volunteer as Academic Year Casework Volunteers in the National Pro Bono Centre on Chancery Lane, London. The Casework Volunteer positions are for one day a week from 4th February to 3rd June 2019. Requirements: You must have completed at least one year of law-related study or have one-year experience of law-related work experience. Voluntary sector and office experience is preferred but not essential. Find more information on their website here. The Application Pack and Information Sheet can be found below. All Applications should be sent to: volunteercoordinator@weareadvocate.org.uk. We would like to share, with those of you who want to pursue a career of solicitor, a useful guide for Vacation Scheme and Training Contract Applications. It is designed to help you with managing your time wisely depending on when the deadlines are for your chosen firms. One-to-one careers advice on how to decide on a career path, how to sell yourself on paper and in person, and effective jobsearch strategies. Appointments are bookable from 10am on the day by coming into the Careers Zone (SL62) or by phoning 020 7898 4115. If you are unable to come in person for your appointment, please email careers@soas.ac.uk. Please note: we cannot guarantee that you will see a particular Careers Consultant. A drop-in session for CV, cover letter or application advice. Just come to the Careers Zone from 1-3pm Mon-Fri (term-time only). If you are unable to come in person for your appointment, please email careers@soas.ac.uk. Please note: we cannot guarantee that you will see a particular Application Adviser. 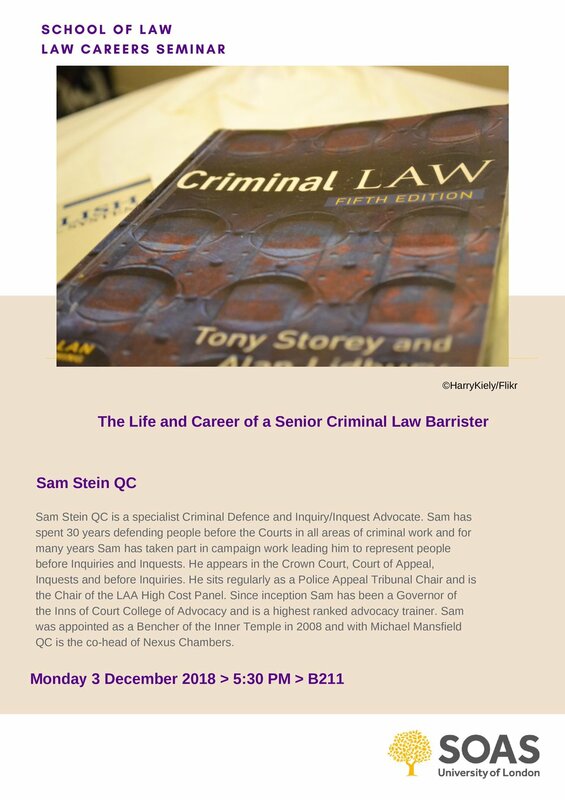 Sam Stein QC is a specialist Criminal Defence and Inquiry/Inquest Advocate. Sam has spent 30 years defending people before the Courts in all areas of criminal work and for many years Sam has taken part in campaign work leading him to represent people before Inquiries and Inquests. Sam has been a Governor of the Inns of Court College of Advocacy and is the highest ranked advocacy trainer. Do you know how to reference your cases properly? Do you know how to find that perfect case for your essay? Do you know how to access books, journals, and legislation with one click? If you answered no to any of these, come to one of the Westlaw training sessions this week! The SOAS Law Journal welcomes submissions from graduate and professional contributors. This is your chance to officially publish one of your legal writings, on paper and online, through the name of a leading UK institution. In preparing your submission, please make note of our mandatory guidelines. These can be found at https://www.soaslawjournal.org/submissions. Articles which do not comply with these guidelines may not be considered for publication. 1. We will not consider articles previously published or otherwise under consideration at other publications. 2. Submissions are to be emailed to submissions@soaslawjournal.org. 3. Submissions must be accompanied by an Article submission cover sheet. 4. Submissions must be 5,000 - 10,000 words (excluding footnotes). 5. Citations must comply with the OSCOLA standard. 6. Deadline: Friday 23rd November 2018. To our editors, the ideal article is well-researched, nuanced with context, and critically analyses contemporary legal issues. It will often include interdisciplinary and comparative research. Basic elements of our selection criteria follow below. 1.Content: The article must of a legal nature. 2.Academic Quality: The article must not be a repetition of existing works. 3.Readability: The article must be well structured and written in plain English. 4. Referencing: Articles are diligently monitored for plagiarism. All work must be accurately referenced. Do not hesitate to email the SOAS Law Journal Executive Board at soaslawjournal@soas.ac.uk for further information. The SOAS Law Society is proud to announce that we are sponsoring the London Law Conference, the first ever student-run law conference held in London. APPLICATIONS FOR THE INAUGURAL LONDON LAW CONFERENCE ARE NOW OPEN! Students from all years of study and degree backgrounds are encouraged to apply! Brexit, legal-tech, blockchain... Do you want to know what these terms really mean and the impact they will have on the legal industry? Join us at the London Law Conference, where we will be discussing the 'Future of the Legal Industry'. Come and meet the most senior people in law, grow your network and increase your chances of securing a vacation scheme or training contract! This year’s PRESTIGIOUS AND INCREDIBLY SENIOR line-up will not disappoint! Stay tuned for more speaker reveals, more seniority is yet to come! Find it difficult to distinguish Magic Circle over US law firm? This panel will help you understand the differences between law firms and broaden your understanding of the role of a trainee. Legal-tech is the big buzzword within the legal industry, but what does it really mean? More importantly, how will it affect YOU in the future? Join our guest speaker, a former Associate at Freshfields, to find out more about his successful legal-tech start-up. After learning all about a career in law, Allen & Overy will be running an Application Workshop, helping you understand what makes a perfect application. APPLY EARLY to avoid missing out on this unforgettable event - this Conference provides it with all, you do not want to miss it. Applications are reviewed on a rolling basis. 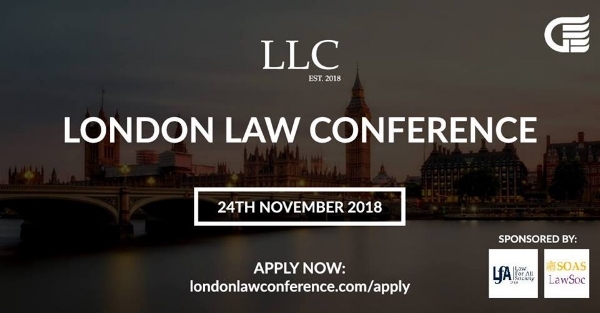 For any questions, please contact us at londonlawconference@gmail.com or on Facebook. Want to be master or mistress of the moots? Learn the secrets to mooting success from an expert barrister. To register, visit the link on the poster below. 19th November 2018, 18:00 - 22:00 at Bounce Farringdon. Tired of the usual boring law firm presentation evening? The BCLP Brand Ambassadors (Evelina, Saeed & Sarah) are inviting 20 students from SOAS to an innovative networking experience at Bounce Farringdon! Come and meet BCLP trainees, lawyers graduate recruitment team and your peers from UCL, KCL, and QMUL whilst taking playing ping pong with complementary canapes and drinks. You will also have the opportunity to win a prize as part of a ping pong competition. SOAS students must register here. Please note that this event is subject to the SOAS Law Society non-attendance policy. Please ensure that you only register if you intend to attend. For further information, please find the Facebook event page here. Please find attached a spreadsheet of Pro Bono opportunities. This spreadsheet will be updated monthly with additional organisations and vacancies as they are advertised. While this document is not exhaustive of all the organisations out there, we hope that it might help direct you as much as possible to the kinds of pro bono organisations and charities you can get involved with. If you have any questions about the document or the application process, please feel free to contact the Pro Bono Officer! 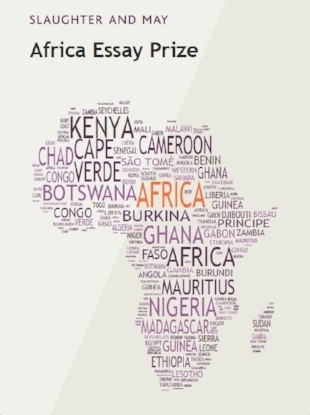 The Slaughter and May Africa Essay Prize is an exciting opportunity for law and non-law students to demonstrate their commercial and legal skills in an African context and have the chance to win a substantial prize. Africa is an increasingly important part of Slaughter and May’s practice. Many of the firm’s clients have operations in African jurisdictions and it is frequently necessary for the firm to find solutions to challenging legal issues in Africa, in collaboration with outstanding local law firms across the continent. Slaughter and May also provide advice to various African governments. In light of this, the Slaughter and May Africa Essay Prize is intended to stimulate debate among university students around the important issues to which African commerce and law give rise. Do African countries benefit from the International Criminal Court? During Theresa May’s first trip to the continent as prime minister, May said “But I am also unashamed about the need to ensure that our aid programme works for the UK. So today I am committing that our development spending will not only combat extreme poverty, but at the same time tackle global challenges and support our own national interest.” Is it legitimate for the UK to tie development spending to its national interest? The deadline for entries is Friday 11 January 2019. To enter the competition please click HERE to complete the form and upload your essay submission. Are you an LGBT* student interested in a career in commercial law? For the eighth year running Bryan Cave Leighton Paisner (BCLP) will be participating in DiversCity, on Monday 26 November, with the biggest line up of law firms to date! This year’s line-up includes Ashurst, Baker & McKenzie, BLP, Clifford Chance, Gowling WLG, HSF, Hogan Lovells, Linklaters, Millbank, Olswang, Pinsent Masons, RPC, Reed Smith, Slaughter & May, Taylor Wessing and White & Case. This is a one-day event where you will get the opportunity to meet with a range of law firms. If you would like to attend please submit your application by Friday 16 November via this link. The Bar Society is organising its first moot of the year, with two rounds, on the 21st of November, and the 5th of December. If you are interested in applying as a mooter please send a 200-word motivational statement and a CV to soasbarsoc@soas.ac.uk. Before applying, please make sure you are available on both dates. The SOAS Bar Society is hosting its annual meet and greet session on Wednesday 14th November from 6 -7:30 pm in the Senate House Law Learning Lab. Come along for some delicious snacks and drinks, meet the committee members, learn more about the Bar Society and get some insight into the life at the Bar from an exciting guest speaker from Lincoln’s Inn. We hope to see you there! Enhance your commercial awareness, develop your negotiation skills and get into the topic everyone is talking about: legal tech. Three key skills-hits in once action-packed interactive session. The session will be delivered by Sarah Burr. Sarah Burr qualified as a solicitor in 2002 into commercial property. Sarah worked on a broad range of commercial property matters including landlord and tenant asset management work, site acquisitions and disposals on behalf of developers, property companies and institutional investors. Sarah joined BPP University Law School in 2008 and has taught across various LPC programmes (full time, part time and the accelerated course). Sarah teaches on the LPC and Legal Apprenticeship programme and is joint module leader of the Commercial Property in Practice Paralegal Apprenticeship course. The deadline for the application is 13th October. Our Committee will review the applications. The shortlisted candidates notified shortly and interviewed on 15th-17th October. Take some time to consider which position is best suited to your current experiences and skill set. Should you require any further clarity, do not hesitate to get into contact with us. Please ensure that you understand the level of commitment expected from each position before you apply for the roles. Despite the extra responsibility, the work is very rewarding, and the leadership position will certainly reflect well on your CV! Wishing you all the best in your application! Welcome to SOAS, and congratulations on being accepted into one of the most unique and interesting Law schools of the country! Your time at SOAS will be possibly some of the best years of your life, where you will grow as a person, learn a lot, and explore what you would like to do later with your degree. It can be a daunting task, and many first years are not familiar with how an English Law degree works, how to study effectively, and what your options are once you are finished, so to help make your first few weeks at SOAS as easy as possible, we have compiled a set of useful descriptions and guides for you to help understand these a little better. The two main career paths that you can take after your degree are becoming either a barrister or a solicitor. Barristers specialise in representing clients in the courtroom. They have to present their client’s case before the jury and the judges, and persuade them to rule in favour of their client, or give them a more favourable judgment at least. They are skilled public speakers, and have extended knowledge of case law and legislation. In order to become a barrister, you will first need to have a qualifying Law degree (such as the LLB, or study any other non-law degree and take the one-year Graduate Diploma in Law). After that, you will have to take the BPTC (Bar Professional Training Course) at a higher education institution in the UK, and join one of the four Inns of Court. During your BPTC, you will learn key skills needed for becoming a barrister, and will receive the qualifications that allow you to practise law. When you are done with your BPTC, you will be called to the bar, and will be able to officially begin your legal career. Solicitors are legal practitioners who will usually be the first person people turn to when they are seeking legal advice. They have a more direct relationship with their clients than barristers do, and they usually guide a client through every problem that they may face, but will not represent them in court. They also are trained in drafting contracts, wills, and other administrative matters. They often instruct barristers on how to represent their client, too. To become a solicitor, you will first need to have a qualifying law degree, (such as the LLB, or study any other non-law degree, and take the one-year Graduate Diploma in Law). Afterwards, you have to do a training course called the LPC (Legal Practice Course), in which you have to study both areas of law, such as Business Law, and take courses in skills that will prove useful during your career as a solicitor, such as Drafting documents. Once you are done with your LPC, you have to do a two-year training with a firm. After that, you will officially be allowed to practice as a solicitor. Do I have to work in commercial law? No! Of course not. 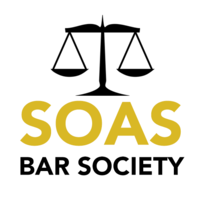 Many people who attend SOAS do not wish to enter into the field of commercial law – instead, they end up in other areas of law, such as Criminal, Family, Immigration, or Human Rights. They often work for NGOs, charities, and potentially even various government bodies, like the Home Department. Keep an eye out for articles in which we will explore non-commercial options after finishing your Law degree! Do I have to become a solicitor or a barrister? No, you don’t have to. Many people choose to, but that doesn’t mean that you have to do it too. Other career paths include, but aren’t limited to: academic research, paralegal, in-house advisor, legal secretary, law enforcement, legal publishing, and many others. We will try our best throughout the year to include as many different career options in our articles as possible, so that you will have a more rounded picture of what your future might entail. First of all – we know that this can be a lot to take in at once. It can be hard to start university, and it often proves to be a difficult time for many, but it doesn’t have to be! The SOAS Law Society is here to help you. We organise many events throughout the year, which will help you understand the legal world a little better, explore your career options, and meet new people. We will be here for you to try and make the transition from college to university a bit easier. Feel free to approach us and talk to us anytime. You will also have a personal advisor, who is a teacher and tutor in the Law school. They are there for you to help you with any questions, problems, and issues that you might have throughout the year. It is highly recommended that you meet with them at least once per term. The Student Hub in the Paul Webley Wing is able to tell you exactly where everything is, and who you should turn to if you have a problem within the SOAS administration system, with your module sign up, or just generally do not know who would be able to help you out. You usually do not need to make an appointment with them, and they are open during teaching time, on week days. Your coursemates will also be a good support system for you, as well as your friends from outside of the course. They might offer you not only emotional support, but also academic support. You can organise study sessions, which we find to be extremely useful in preparation for tutorials and exams. Make sure that you have a support system to rely on, for it can drastically change how your university experience turns out. Lastly, the Student Advice and Wellbeing centre will be able to help you with personal, mental health, and just general advice issues. 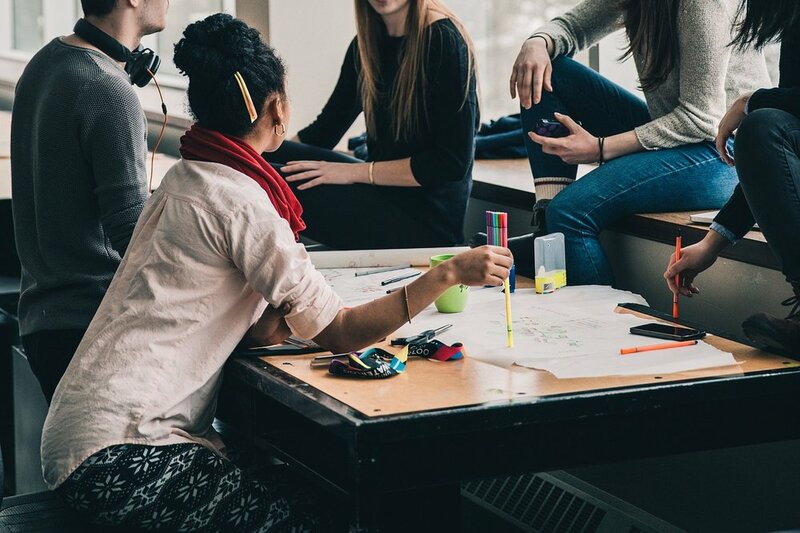 They can help you with most things that you might face throughout your time at SOAS, and they can even provide you with free counselling sessions. Also, they sometimes bring in puppies and provide free massages too, which are a godsend especially during exam season. How can I study effectively? You should try to utilise as much of the study spaces at SOAS and at your home as possible. Very often people struggle to study in their rooms, as it is too comfortable and they get carried away by doing what they normally would (aka browsing the internet and not studying) instead of using their study time for what they wanted to do. It can be helpful to study in new environments, such as the SOAS Library, which has many books that you may find helpful; the Senate House library, which has very comfortable sofas and loads of seating; the Learning Hub in the Paul Webley Wing, where you can chat with your coursemates and exchange ideas; or just any nearby café to fuel your brain. Finding the study guides, books, and online resources that work for you are also vital. Many basic terms will be unfamiliar to you, so getting a Legal Dictionary can be helpful if you would like to avoid online dictionaries, which can give you the wrong meaning of the word that you are looking for. Getting good study guides, such as LawExpress or Nutshell Cases can help you too, because they provide the same material as what you study in your classes (but with shorter, less detailed explanations), and they are worded differently – sometimes, the only thing you need is for someone to describe the same concept in a different way. There are many online video tutorials available for your core modules, which can be great for when you are too tired to read anymore. They are often done by legal professionals, who teach or used to teach at universities, and can be a great way of understanding new concepts. And lastly, utilise websites like Westlaw as much as you can! As easy as it sounds to just read the cases on Wikipedia, the information there isn’t as reliable as the ones on professional legal websites. You will be able to read whole cases on such websites, including the judges’ commentary on the case, which will be a good way to show that you actually understand the case. You can also find legislation there, with explanation on whether the legislation is still enforced or not. We know that studying Law is so different than what many of you have done before, but it is honestly one of the most exciting subjects that you could’ve chosen to study. We are looking forward to meeting as many of you as possible throughout the year, and wish you the best of luck! A very warm welcome and welcome back to the freshers and returning students respectively. We hope you have had a restful and enjoyable summer. This year, the SOAS Law Society has prepared a variety of workshops, competitions, networking events, socials and many more for you. We wish to help and equip you with the necessary skillsets as well as opportunities to enter the professional world. We would also like to make your time at SOAS much more enjoyable and fulfilling throughout. For more information, please visit our booth at the Freshers' Fayre this Friday, 28th September. We wish you a successful year ahead, and we look forward to meeting you all of you very soon! Many thanks to all who have voted and partaken in selecting their preferred candidates for the SOAS Law Society 2018/19 Committee! Congratulations to the elected committee! We wish you the very best over the coming year!